This dish is perfect as a stand-alone meal served with salad, or as a delicious accompaniment to meat or fish main meals. Preheat the oven to 180ºC, gas mark 4. Line a baking tray with baking parchment or kitchen foil. 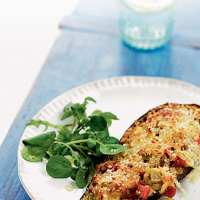 Use a sharp knife to cut all around the inside edge of each aubergine half. Remove the aubergine flesh and chop finely. Reserve the skins. Heat the oil in a frying pan and add the chopped aubergine flesh, onion, celery, peppers and seasoning, and sauté for 4–5 minutes to soften. Remove from the heat and stir in the tomatoes. Divide the mixture equally between the 4 skins, scatter with the mozzarella and then the breadcrumbs. Place on the prepared baking tray and bake for 25–30 minutes until the skins are soft and the tops lightly crisp and golden. Serve with a watercress salad and some crusty bread. Create a different texture and taste to the filling by adding toasted pine nuts with the tomatoes. These flavours will be ideal with a fresh and zesty Californian Chardonnay like the Fetzer Valley Oaks Chardonnay 2007/08 – it’s full of ripe fruit, and suitable for vegetarians.